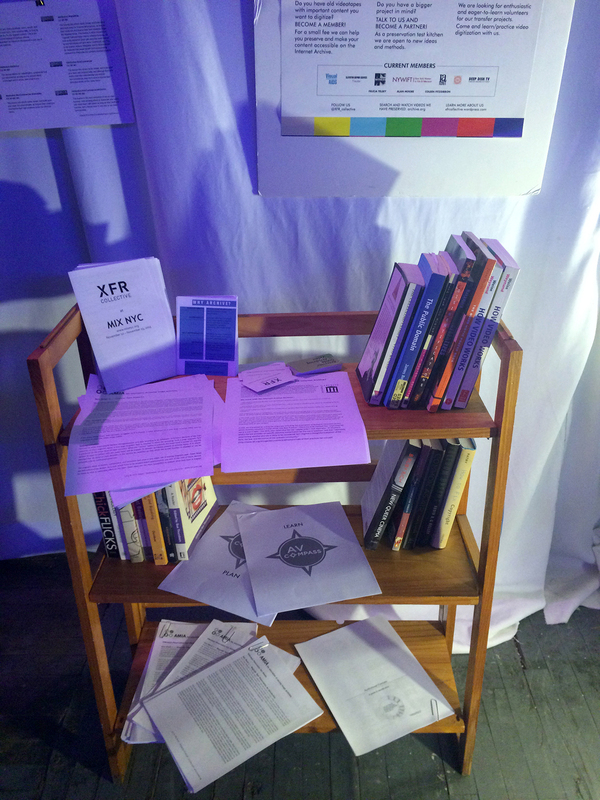 “Coming here is such a weird thing for an archival organization to do,” XFR Collective member Rachel Mattson tells me. We are standing in the middle of a warehouse in Sunset Park. A naked man strolls past, bathed in the glow of projections, heading toward a huge cat-shaped structure that visitors enter from between the hind legs. 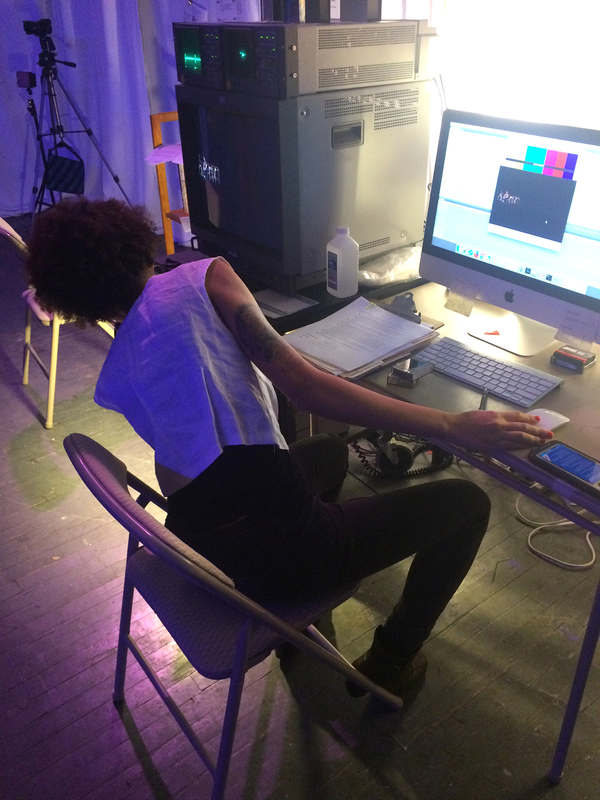 It’s the opening night of MIX NYC’s 28th New York Queer Experimental Film Festival, and at the entrance to the festival’s art installations, XFR Collective (pronounced “transfer collective”) has set up their decks and monitors, ready for work. 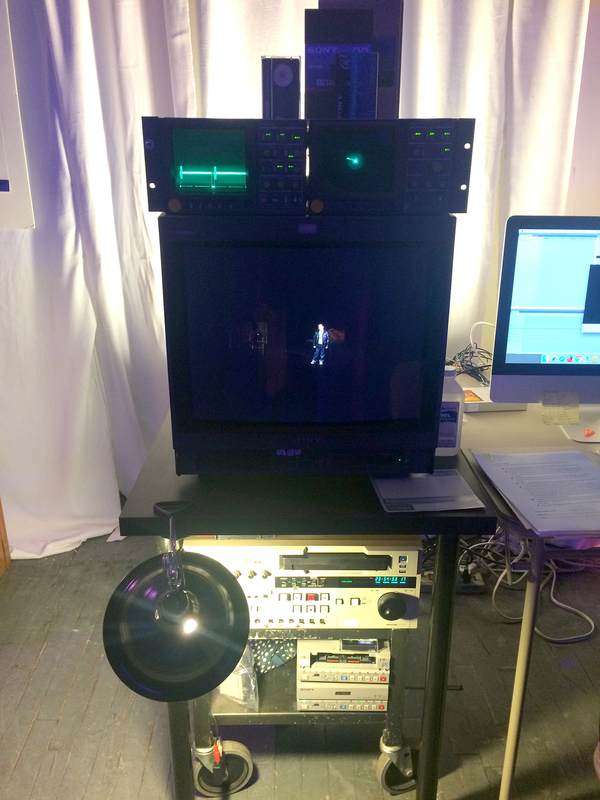 The history of archives is one of caring for paper material, and audiovisual material is often overlooked. There’s less urgency to preserve moments so recent they were recorded on videotape, and doing so requires a unique set of interests and expertise. 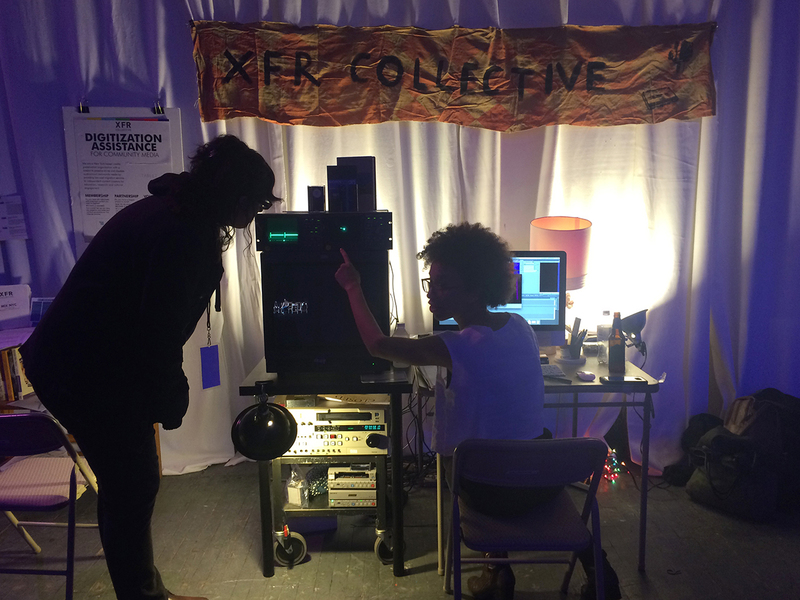 That’s where XFR Collective comes in, offering low-cost digitization services to communities outside the mainstream. A sense of impending doom underlies conversations with XFR Collective members, who crusade against what’s known as the Magnetic Media Crisis. Videotape degrades over time. Statistics aren’t conclusive about how quickly this happens, but studies document quality reduction after just 10 years. Mattson explains, “It’s not only about the condition of the media itself; it’s more about the playback deck. Unlike film, you can’t hold video up to the light and see what’s on it. It’s an electric signal, so you have to play it to see it.” With the video industry’s move toward digital, tapes and the decks that read them are no longer produced, and the people who know how to use (and more importantly fix) them are aging. Some archives and museums have started to stockpile equipment, but if an individual wants to preserve their own media, professional digitization vendors can be prohibitively expensive. “Those home movies might be the only documentation of a really important event or a specific cultural lifestyle,” Lascu says. 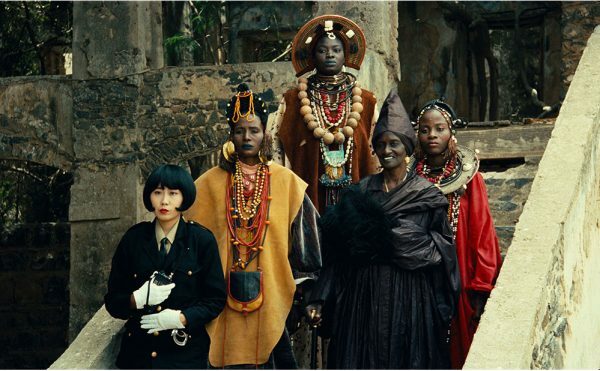 “The cultural narrative is often filtered through a specific group of people, and so we want to reach out to the people who are normally left out of that.” XFR Collective isn’t alone in trying to preserve the visual history of marginalized peoples. The group is part of the lineage of the 1960s New Social History movement, which emphasized the politics inherent in archiving and sought to document voices unheard. Other organizations that stem from this tradition are Interference Archive, Librarians With Palestine, the Culture in Transit Project, and the Lesbian Herstory Archives. But none of these focuses specifically on analog video, or on artists. 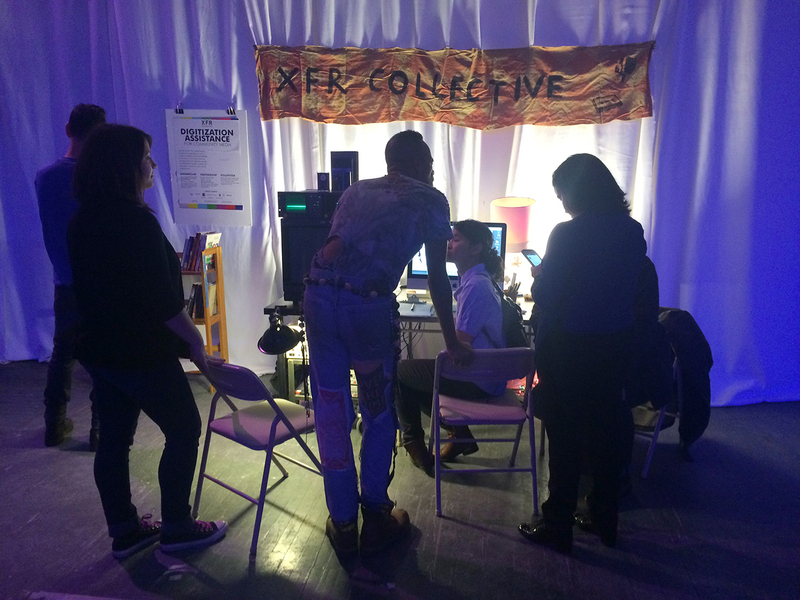 A visitor talks with XFR Collective members. MIX NYC 2015 continues at 155 26th Street (Sunset Park, Brooklyn) through November 15. Correction: This article originally misstated the name of the NYU program that many XFR Collective members attended as well as the number of tapes of a gay Latino public access show. Both have been fixed.